Hydraulic Cylinder Market size was over USD 10 billion in 2015 and in term of volume, is anticipated to grow over 6%. Increasing infrastructure investment by emerging economies will drive the hydraulic cylinder market size growth during forecast period. Government of India is planning to invest over USD 375 billion in infrastructure sector by 2019, out of which USD 120.49 accounted for developing 27 industrial cluster, USD 75.30 billion for port connectivity, road and railway projects. Robust demand for innovative agriculture equipment to improve productivity and conserve energy will augment hydraulic cylinder market demand. Expansion of food processing industries coupled with increasing investment in agricultural sectors will boost the demand for equipment during forecast period. Growing demand for material handling equipment to minimize the risk of downtime will propel the global hydraulic cylinder market share in the near terms. Material handling equipment, such as level luffing cranes and electronic overhead traveling cranes, are used across a wide range of industrial application which include power, food & beverage, retail, and oil & gas. Increasing fracturing equipment demand for the extraction of shale gas in the U.S. may favor industry growth. Change in production, capacity expansion and capacity utilization are some of the factor which will positively impact industrial equipment demand. Single acting hydraulic cylinder market size was USD 3.12 billion in 2015. In term of volume, is expected to witness gains at over 6 % subject to better efficiency in DC power applications. It performs a single-direction operation. Rod hydraulic cylinders market share, owing to its wide application in agriculture equipment industry is predicted to expand at the rate of over 6 % in future. These product offer advantage of standard specification couple with easy repair when compared with other available products. Welded product is likely to be worth over 11 billion in 2025. These products are main in material handling, construction, industrial and mining equipment. 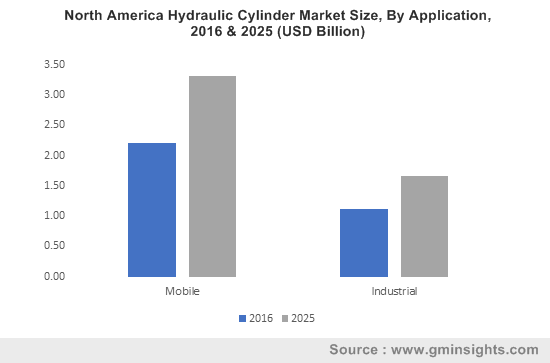 Mobile hydraulic cylinder market size was dominant in 2015 and is estimated to reach over 35 million units by 2025 owing to increasing demand for agricultural and material handling equipment. Increase in industrialization and construction activities will further compliment the industry. Industrial application accounted for over 32% of total market share in 2015 and in terms of revenue is expected to see growth over 4% by 2025. China hydraulic cylinder market size is anticipated to reach over USD 1 billion by 2025 owing to heavy investment in infrastructure sector. The Chinese government has announced to invest over USD 151 million on Hubei Xiaogan logistics infrastructure project. U.S. hydraulic cylinder market size is estimated to reach over USD 3 billion by 2025. Increasing investment on aerospace, defense and material handling will further compliment the industry growth. Russia is expected to witness a gains at over 3% during the forecast period. Increasing demand for agricultural and construction equipment will boost the product demand in future. Adoption of automatic agriculture equipment coupled with increasing infrastructure spending will drive the demand for cylinders in India. As per 12th year plan the government of India will spend around USD 1 trillion on infrastructure sector which will boost the demand for equipment during the forecast period. Major industry participants include Wipro Infrastructure Engineering, Bosch Rexroth AG, Best Metal Products, Aggressive Inc, Eaton Corporation PLC, Hannon LLC, Ligon Industries, LLC, Perfection, Prince Manufacturing Corporation, YELETSGIDROAGREGAT, Hydrapac Italia, Burnside Autocyl (Tullow) Ltd, chapel hydraulique, Baltic, United Hydraulics, Bailey International LLC, Caterpillar Inc., Enerpac Corp., Hyco International, Inc, Parker-Hannifin Corporation, Precision group Inc, Texas Inc, Norrhydro Oy, Hydrosila, Pacoma GmbH, Weber-Hydraulik Group. Hydraulic cylinder, a mechanical actuator, used to provide unidirectional force with the help of unidirectional stroke. It has wide application in construction, industrial, manufacturing and agricultural equipments. Rapid industrialization coupled with economic growth in developing countries will drive the industry growth during forecast period. Replacement demand in developed economies will further boost the equipment demand. Geopolitical issue and decline in commodity prices are some factors which may restrain this industry. Historical data coverage: 2013 to 2015; Growth Projections: 2016 to 2025.